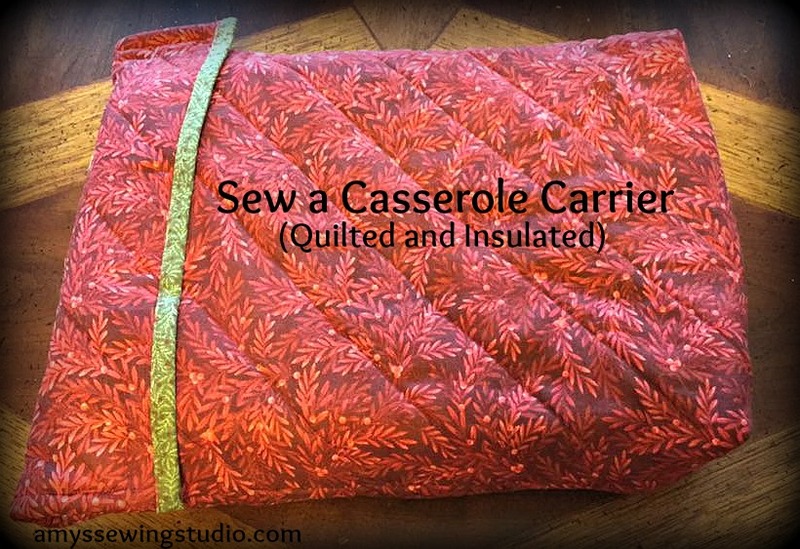 Keep your hot foods HOT and cold foods COLD and Sew a Casserole Carrier: Quilted & Insulated! 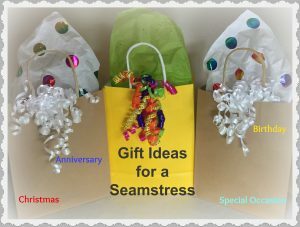 Fabric- One yard if using same fabric for inside and outside of carrier OR Two different fabrics- One yard for the outer fabric and one yard for the inner fabric; purchasing one yard each of two different fabrics will allow you to make an extra carrier for a gift! Or you could just purchase 1/2 yard each of two fabrics and the actual width of the fabric will then be your length measurement. Fabric, Batting and Insul-Bright pieces need to be 15” wide X 36” (one yard) in length. After all layers are in place, use sewing pins around the outside edges to keep layers together, and then baste around the outside edges. Don’t worry about all sides being perfectly lined up and straight at this time. Quilting tends to shift fabrics. 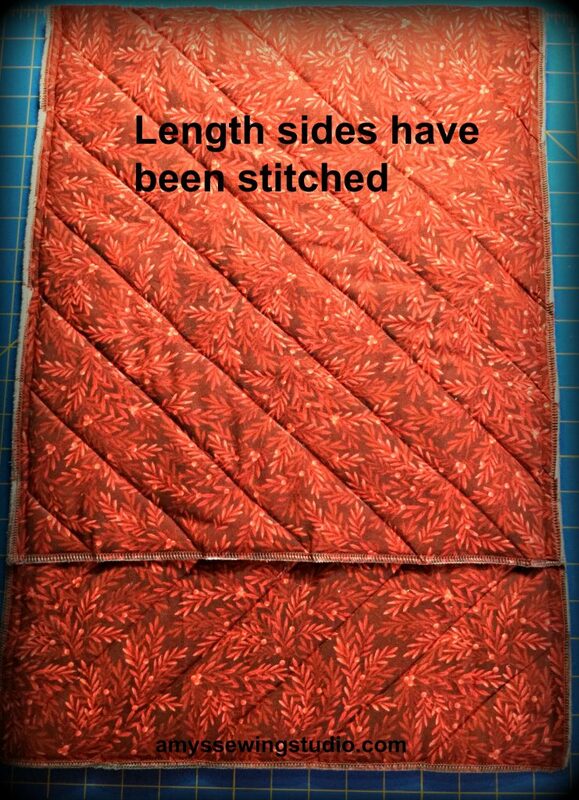 After quilting is done, then you can get the sides straightened up. After you have the outer edges basted, The next step is to use a fabric pencil to draw your stitching design on the fabric for quilting; Quilting is simply stitching thru all layers of fabric to keep layers together. (Pencil lines will wash off, and will also be covered up by your stitching) I just chose to use a diagonal line for my quilting design, each line about 2 inches apart. After you are done drawing your design, Use straight pins or Curved safety pins for holding layers together. Start pinning from the center of the fabric layers and work your way out towards the edges. Why use so many pins? 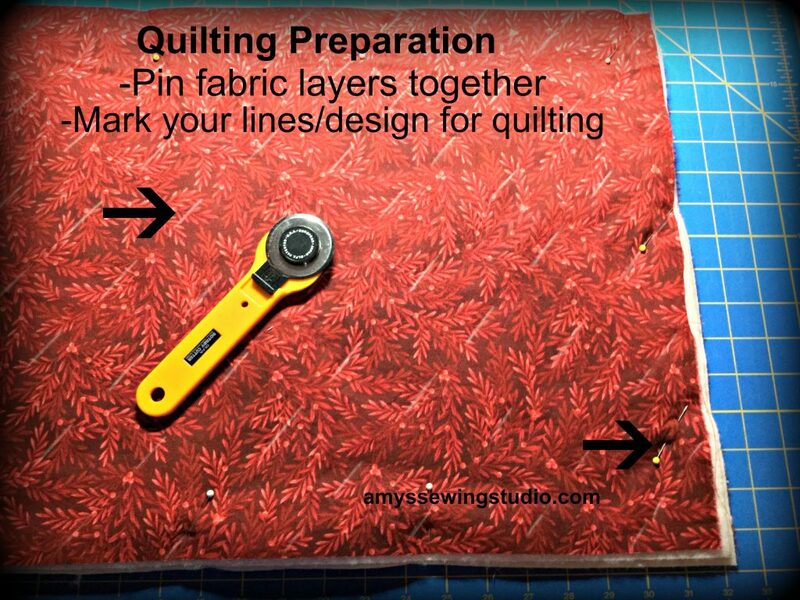 The pins will keep the fabric from shifting as you are quilting/sewing your design. I mentioned using straight pins or Curved Safety Pins for holding the fabric layers together. Using straight pins comes with some hazards: pins falling out of your fabric AND your hands being on the receiving end of many small pin pricks. The best notion to use for pinning your quilt layers is Curved Safety Pins; these stay in your fabric, eliminate pin pricks AND the curved edge makes for easier pinning as opposed to straight edge safety pins. Quilting Safety Pins come in different sizes. 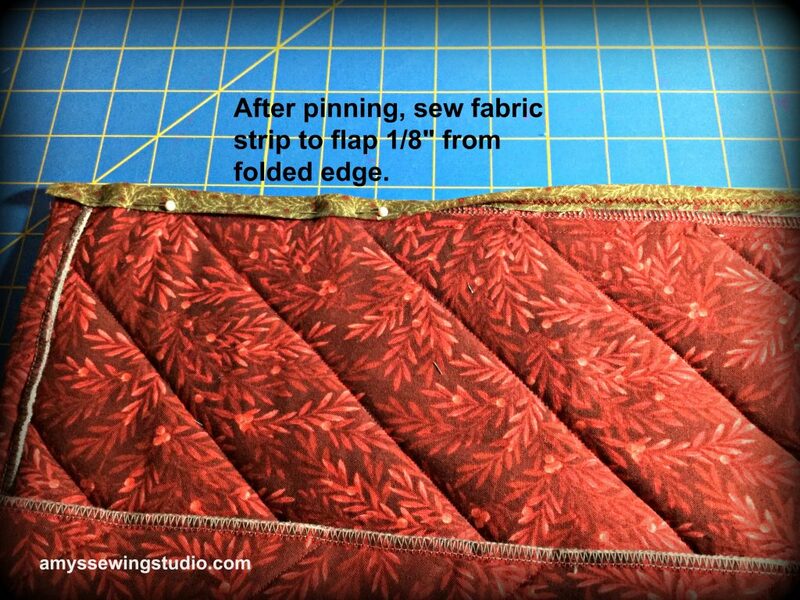 The best size to use for quilting is a Size 2 or 3 pin. If you have arthritis in your hands, the size 3 pin is a little longer and should be easier to pick up. Otherwise, a size 2 curved safety pin will work wonders! 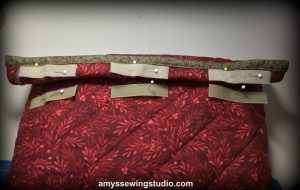 Using curved safety pins for quilting makes the pinning process so much easier. Having the curved side allows the pin to maneuver easier back up thru the layers of fabrics. These pins can be found at your local fabric shop. 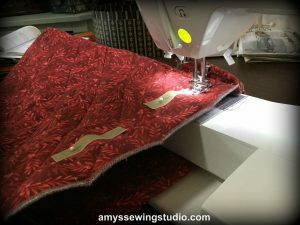 Quilting is simply stitching a design that serves as securing all layers of fabric/batting and adds visual appeal to your insulated food carrier or other quilting project. 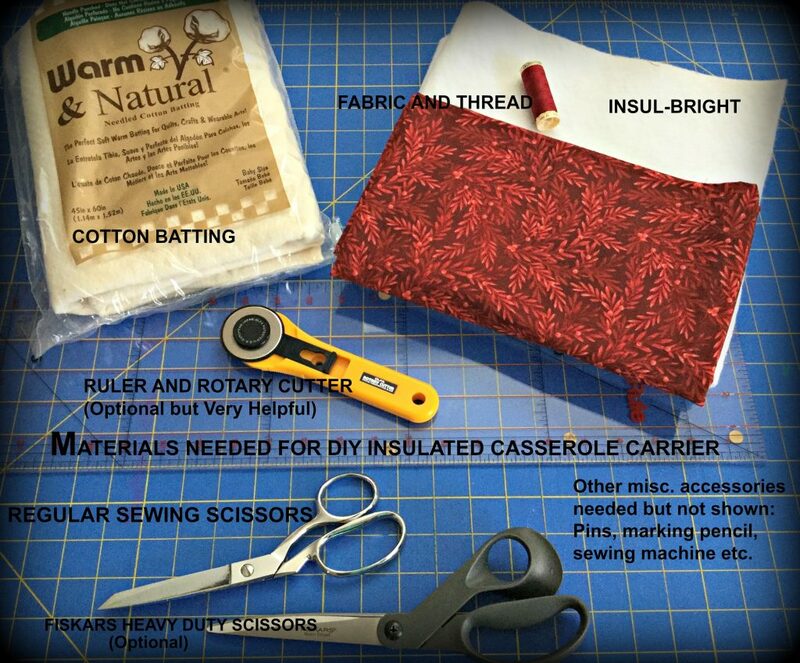 Get Ready, Get Set, Adjust and Start Your Machines to Sew a Casserole Carrier! 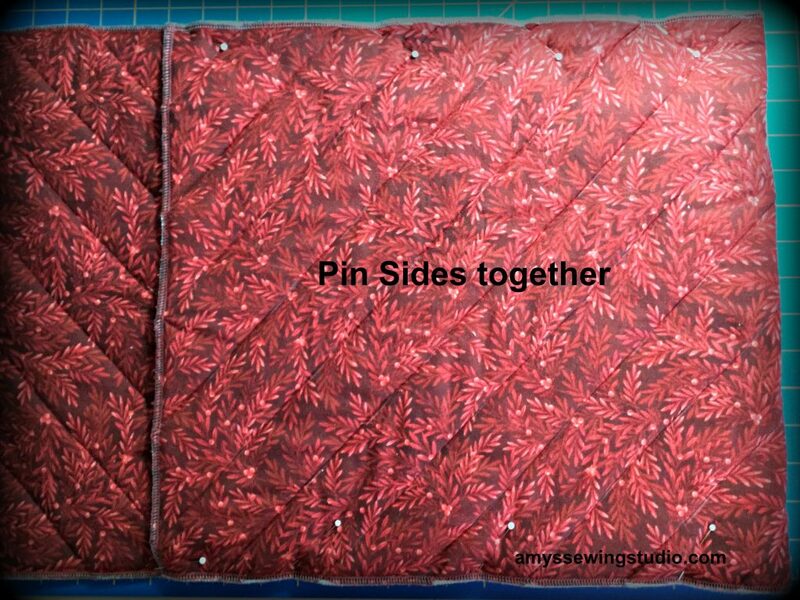 Take pins out as you are quilting and do NOT sew over any pins! If you accidentally sew over a pin, your machine needle may break. After you are done quilting, make sure all outside edges are straight by lining edges to your flat mat and straightening if necessary using a rotary cutter. Use a finishing stitch around the outside edges. I just received a new Juki serger for Christmas, so I chose to serge my outside edges. These are awesome machines and I’m glad I have one now, and I’m bummed I waited this long to ask Santa for one! 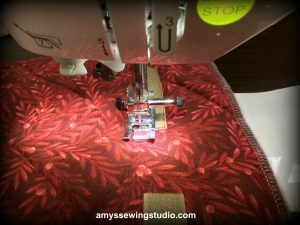 If you do a lot of straight edge stitching, the serger makes this process go ‘sew’ much faster! Lay the quilted piece of fabric on the table, right side of fabric facing up. If you used the same fabric for both sides, there is no a right or wrong side of the fabric. If you can still see the pencil lines from drawing on your quilt design, then use this side as the wrong side; otherwise it doesn’t matter. If you chose two different fabrics, decide which fabric will be showing on the outside of the carrier, and this will be the right side of the fabric. 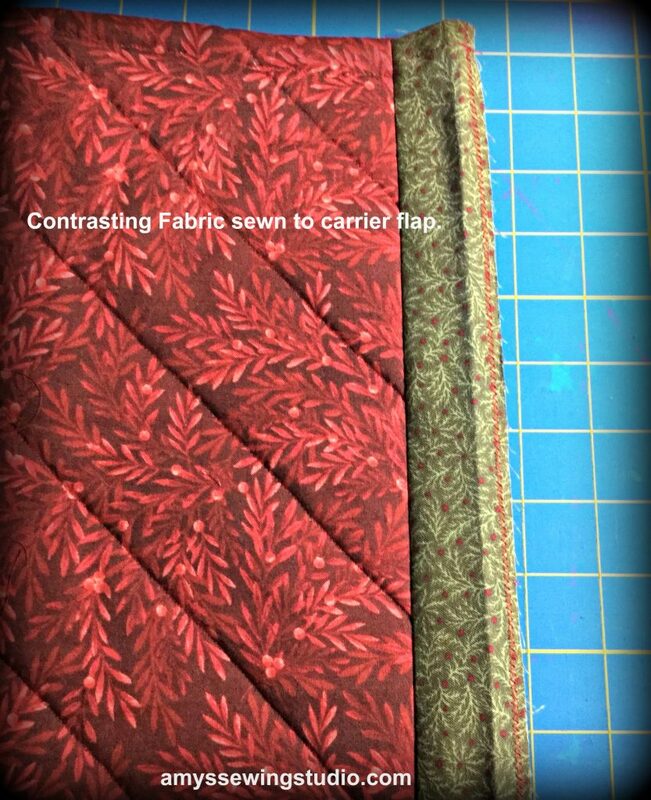 The wrong side of the fabric will be the secondary fabric you chose for the inside of the fabric carrier. Lay the pan on the quilted fabric piece and start moving one width end over the pan until the pan is covered with the quilted fabric piece. The wrong side of the fabric (inside of the carrier) will be facing up. One end of fabric will be longer than the other. The extra length at one end of fabric will be your flap of the carrier. 3. 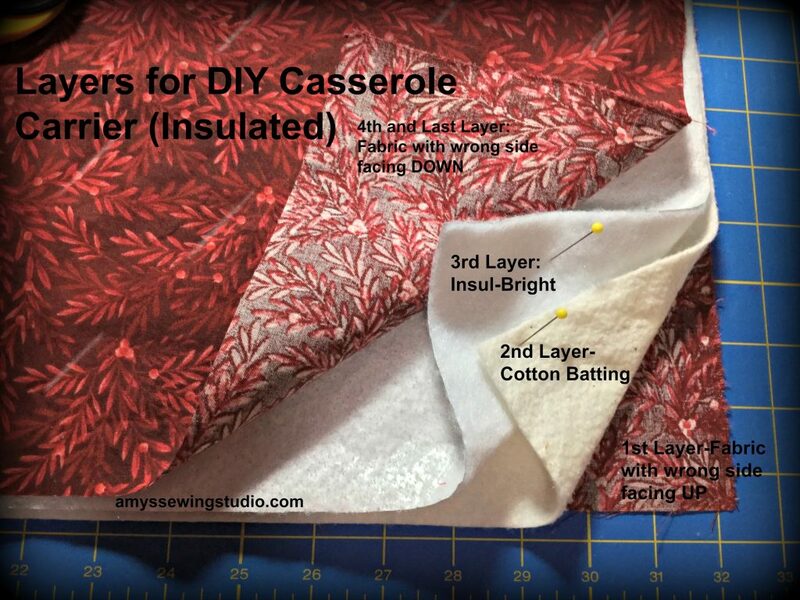 Now you will bring together the layers of fabric and pin at side seams, close to the end of pan at the carrier opening, do this on both sides. 4. Carefully slide pan out of the carrier. 5. Finish pinning sides of casserole carrier together. 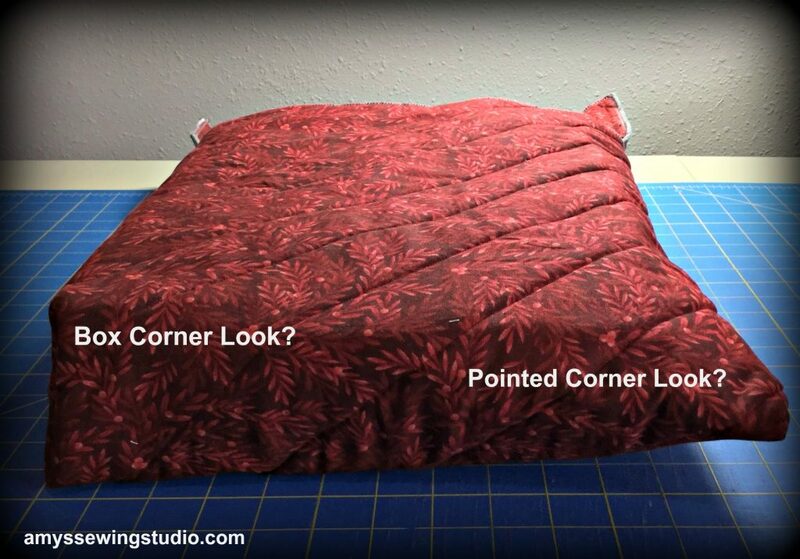 Since this is a beginner sewing project, you get to choose how your corners will look. Will you leave the corners with a point or will you take the challenge of adding depth to your carrier for a more professional look? 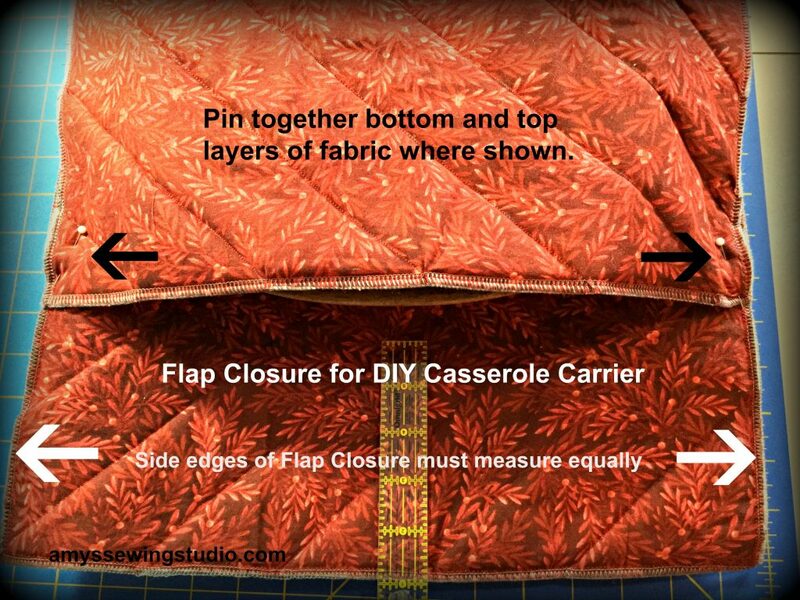 If you choose to just leave the corners as they are, scroll down to finish the Casserole Carrier Flap. Make sure the carrier is still folded WRONG SIDE out. At the folded edge of the fabric, you will be cutting 90 degree corner pieces out of the fabric. Measure corners at 1 1/2 “ square and cut corners out. 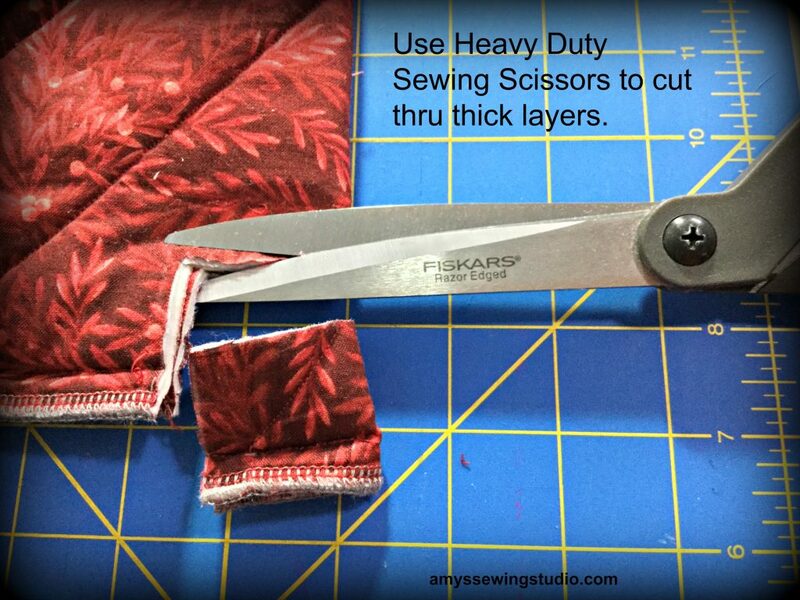 You can use regular sewing shears to cut thru this thick fabric, but it is SO much easier with scissors that are meant to be used with multiple layers of fabric! 2. Bring cut edges together and pin. 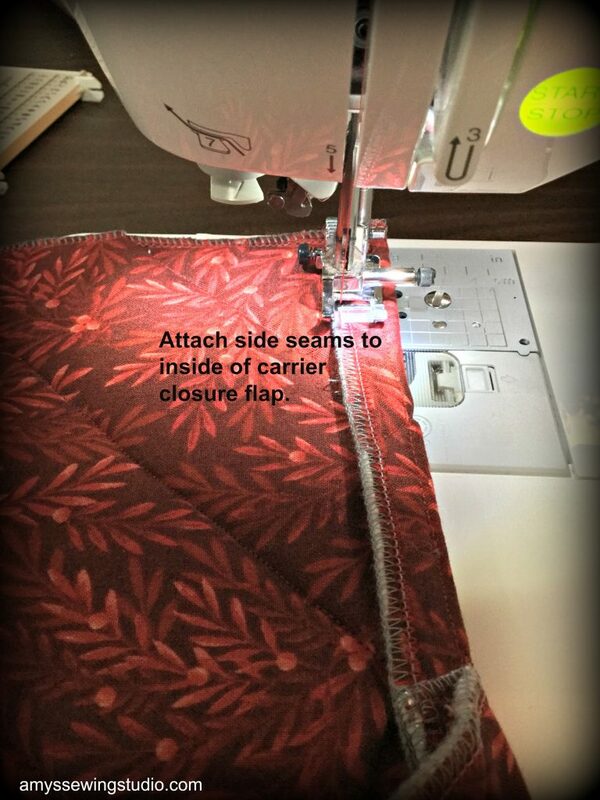 See picture- As you are folding edges, have the side seam face top and center and pin edges together. These edges will be stitched with 3/8” seam allowance. 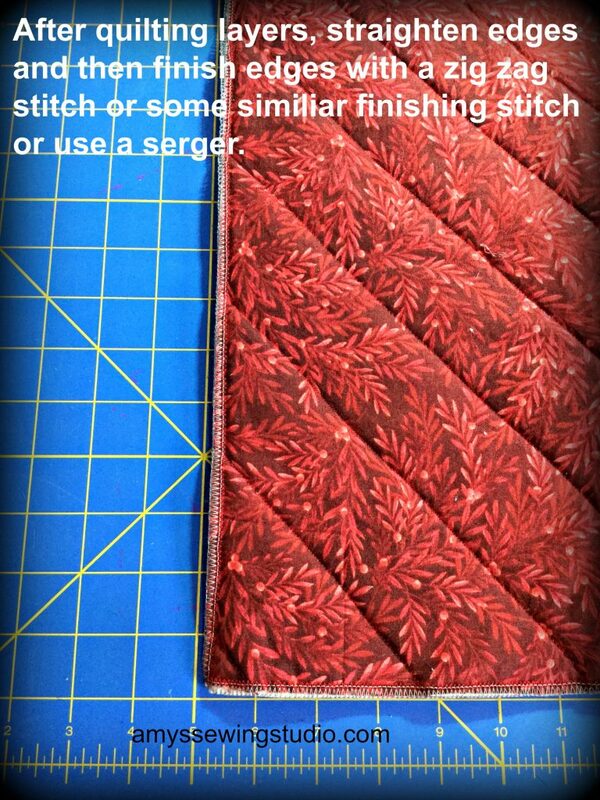 After stitching both corner seams, finish the edges with a zig zag stitch or serger stitch. So close to being finished-you are doing a great job! 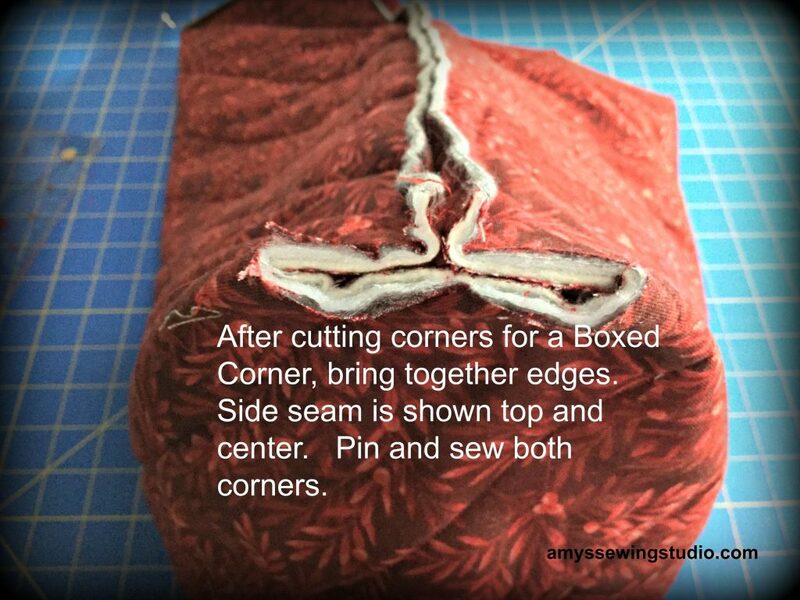 Sew down the side edges of the flap. 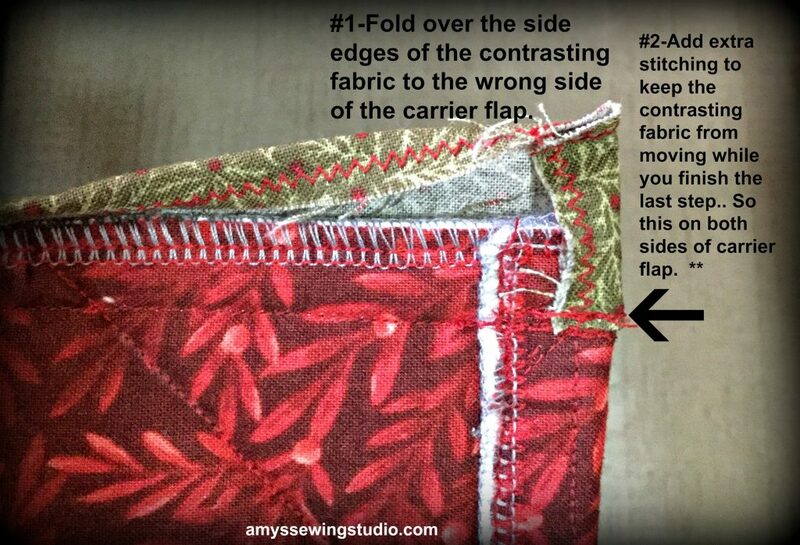 Find a coordinating fabric strip to cover the carrier flap edge. You’ll need this piece to be 2″ wide by ___” long. (You’ll want the fabric strip to be one inch longer than the width of the fabric flap. Fold over the side edges of the contrasting fabric to the wrong side of the carrier flap. Typo in my photo—In step#2, sew the extra stitching line on both ends on the contrasting fabric. 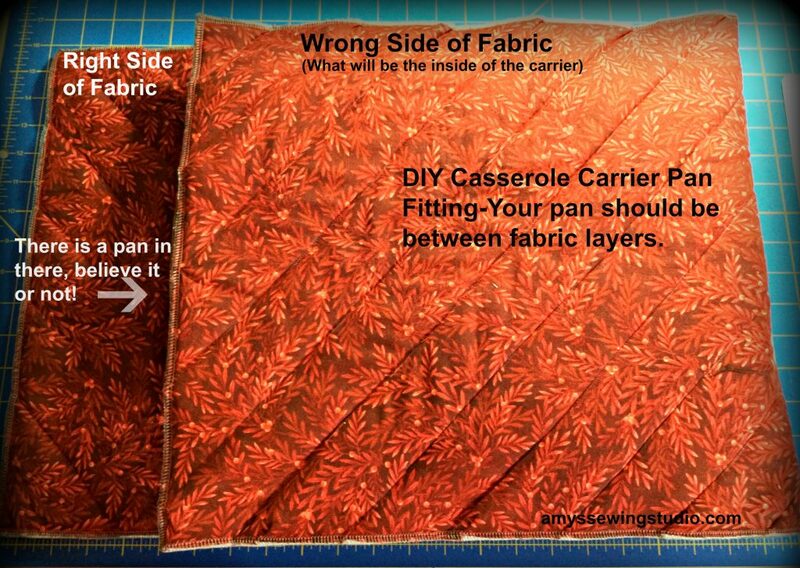 Next to the last step in this casserole carrier tutorial…. Pin down the coordinating fabric strip and sew the fabric strip 1/8″ from folded edge to the carrier flap. So close to being finished! Your Quilted and Insulated Carrier is Finished and ready to use! Great Job! If you have any questions on my wording for the directions, PLEASE send me an email and I’ll be happy to help you out! If you’d like to make coordinating Potholders, check out my Quilted/Insulated Potholder Tutorial! 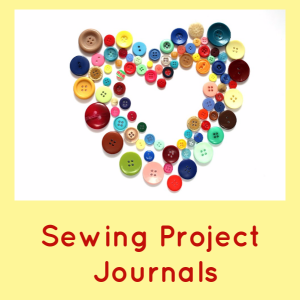 Happy Sewing and Thanks for Reading! 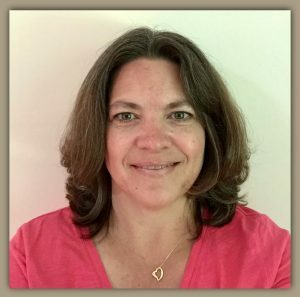 Please help me help others and share this fabulous tutorial on your favorite social media.